As a young artist, Timothy Schmalz faced some tough times. For the first few years he says he lived on a wooden bench in an old warehouse without heating or running water. He knows what it feels like to be on the outskirts of society. So he wanted to create a Jesus that the poor and outcast could relate to. Schmalz’ Jesus lies on a park bench. His face and hands are hidden under the folds of a heavy blanket. The only evidence of the Bible story is the statue’s pierced feet. 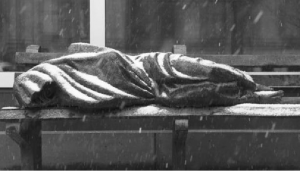 In these cold winter wet days we are reminded that Jesus had nowhere to lay his head. He was a refugee at birth and died on a state-owned cross at death. Jesus was homeless from Alpha to Omega. A park bench may have been his only option on occasion. I invite you to use this picture of Timothy Schmalz’ ‘Homeless Jesus’ as an icon. Take time to reflect on what you see. Maybe imagine yourself sitting on the bench next to Jesus. Are you moved to speak to him or do you sit in silence? How do you feel? 05/31/2015 • What concerns Christ?